The following are two front page stories printed in the Arkansas Gazette 119 years ago today, on June 10, 1894. They tell the story of two baseball games, one in which the home team (the Hot Spring Bathers) was robbed of a victory by an erroneous umpire call and the other in which the Camden Rainmakers demonstrated their superiority over the Morrilton Prohibitionists. 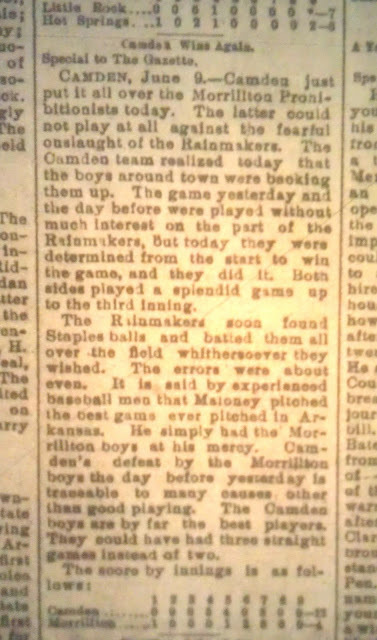 In the second game, the Rainmakers hit the pitching of Morrilton's Staples "whithersoever they wished" and according to some experts, Maloney, the Camden pitcher, threw "the best game ever pitched in Arkansas." 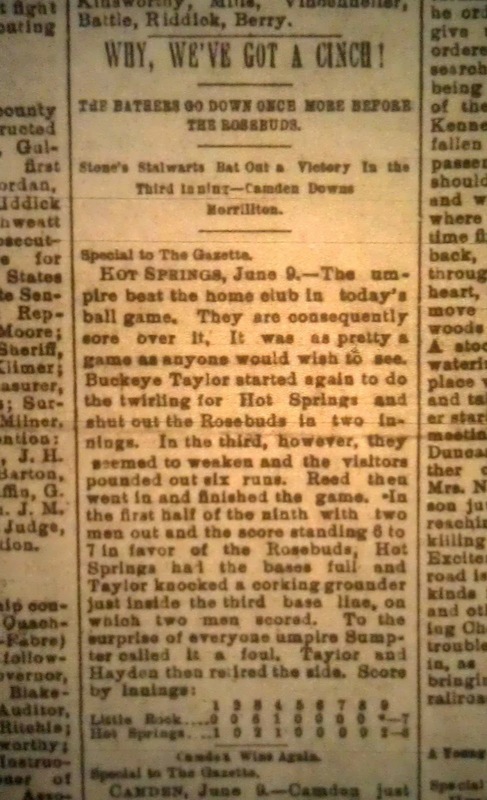 The language of the sports stories in 1894 was a bit more elegant than today, but it is clear that the passion of the writers matched that of writers now covering hometown baseball teams. WHY, WE’VE GOT A CINCH! Camden, June 9.—Camden just put it all over the Morrillton (sic) Prohibitionists today. The latter could not play at all against the fearful onslaught on the Rainmakers. The Camden team realized today that the boys around town were backing them up. The game yesterday and the day before were played without much interest on the part of the Rainmakers, but today they were determined from the start to win the game, and they did. Both sides played a splendid game up to the third inning. The Rainmakers soon found Staples balls and batted them all over the field whithersoever they wished. The errors were about even. It is said by experienced baseball men and Maloney pitched the best game ever pitched in Arkansas. He simply had the Morrillton (sic) boys at this mercy. Camden’s defeat by the Morrillton (sic) boys the day before yesterday is traceable to many causes other than good playing. The Camden boys are by far the best players. They should have had three straight games instead of two.